So you need more space and have decided to extend your home, but what type of extension do you require and what style would you like it to be built in? If you have decided to make your home bigger by adding an extension, before briefing an architect, you need to make some decisions about what type of extension you want. Certain design decisions – such as how many storeys you need and where it will be positioned – will be dictated by your living requirements, and what is allowed under planning permission. However, when it comes to choosing style, form and materials, it helps to know what the options are. Here, we look at a number of extension types and explain where they are best suited. A rapid method of construction that is becoming increasingly popular is to use thin joint masonry systems. These are available now from the main lightweight block manufacturers. They are an attempt to match the inherent advantages of timber frame speed of construction, thermal efficiency and improved airtightness. The joints average 2-3mm in thickness and are achieved by using a special thin joint glue mortar. The technique allows single storeys of a house to be built within a day and fast setting allows work to continue the following day without having to wait for mortar to cure and become stable. This method brings blocklaying times close to the erection times of timber frames, especially when the larger size (645mmx440mm) blocks are used. Using this method the inner leaf shell of a house can be completed within two or three days. Slimming down the mortar in this way does not just speed up the construction process but also helps improve thermal efficiency. One of the main ways in which heat is lost in a house is through the mortar joints. If these are slimmed down, the block manufacturers claim, the gain in thermal efficiency terms is around seven per cent. Using a timber frame will achieve rapid results, afford a high level of airtightness and insulation, and if built correctly, should last as long as masonry systems. Many people, if they can gain permission, go for a timber-framed extension if it is, for example, just a kitchen at the rear of a long low cottage where there was no original kitchen, and the kitchen has been carved out of one of the original living rooms. The temptation is then to reinstate the original room and build a separate kitchen at the rear. A single storey timber framed extension with a pitched roof will form an interesting kitchen if you give it a vaulted ceiling. 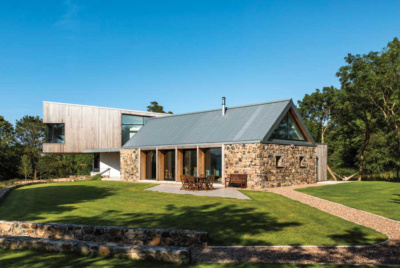 However, although timber frame is quicker to build it will not necessarily be any cheaper than masonry, and some architects and designers will steer away from it for extensions. This is because of a feeling that timber frame is generally not intended to cover large spans and the sort of opening up of rooms associated with modern extensions. You can therefore end up with a lot of steel in the build, which takes away the whole point of timber frame. 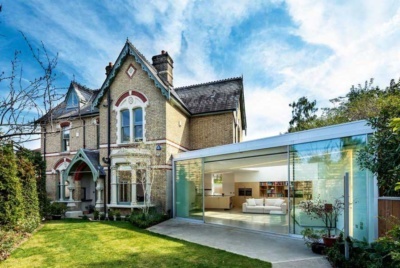 Although deemed strikingly contemporary, a glass box extension can also be the perfect choice for an old building as they are less obtrusive than a masonry option. They also flood the adjoining room with natural light, preventing the common issue of extensions robbing light. However, due to the added engineering of structural glass, they don’t come cheap so expect to budget at least £3,000/m². Because of the exposure of a glass box extension, you do need to think about solar gain. On south-facing elevations you will certainly need to consider the issue of overheating and how this can be mitigated. On a chilly north-facing elevation it will pay to go for glazing with the highest thermal performance that you can afford. These are extensions, inevitably based on timber, that come in kit form. They come in a variety of sizes and can be quickly erected five days from delivery to completed internal walls is not untypical. They come in varying widths and depths, and can vary from 30 to 75m³. Kits cost from around £3,000 to £4,500 including VAT. However bear in mind that this is the price for just the walls plus the timbers for a flat or hipped roof. You still need to carry out all the regular building work for foundations, external brickwork, roof covering and full internal fit-out and flat or pitched roof. Speed is a great advantage of this type of extension. Another is planning permission. A great selling point is that planning permission is only required if an extension increases the size of a terraced house by 50m³ or 10 per cent of the house whichever is the greater. The equivalent figure for semi and detached houses is 70m³ or 15 per cent. Only the largest of these kits exceed 70m³, so for most extensions of this kind it follows that planning permission will not be required. One of the first questions you will need to ask yourself when adding an extension is: Is the style to be the same or a total contrast? In many cases, unless your design is likely to impinge heavily on your neighbours there is unlikely to be a planning permission objection to a contrasting style. Indeed many planners welcome this as imaginative and an improvement on what is there already. The message, therefore, is: Dont be timid. Dont be afraid to change the style if it is likely to give you what you want. Also dont forget that if the size of the extension you are building falls under Permitted Development Rights the planners will be unable to have any influence on your design so you can be as radical as you wish. 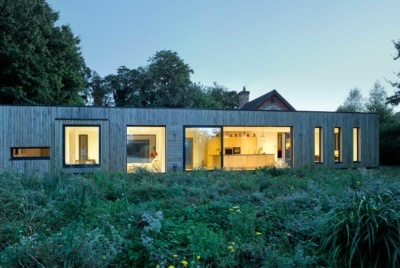 Many architects are against extensions that are a slavish copy of what is there already. And in any case, many would argue, is this not really a form of apology in effect hiding it or pretending it is not there at all? Surely it is far better to create something worth shouting about something that speaks for itself and says something new and exciting? At the same time you should always ask yourself how your planned extension is likely to affect the value of your property. If you are likely to move, as you surely will at some stage, should you take into account the needs of the resale market is what you are planning so adventurous that it might frighten off future potential buyers? In the case of listed buildings, extensions are all too often a case of what the conservation officer and his colleagues will permit. In the case of historic properties that are not listed it might be wise to consult your planners first to see what kind of extension they favour on properties of that sort in your area. If it is a stone house will they permit an extension in reconstituted stone? If it is a Georgian style home will they insist that any extension is in the same style? A catslide is an extension of the existing roofline, often at a shallower pitch, to ground floor ceiling height. By using this technique extra width can be gained and interest added to both the roof and the building. However the roof pitch and style of building have to suit. It is best if there is a steep pitch and this can be extended perhaps flattening out the pitch slightly down to first floor eaves level. This way it will provide 22.5m of width and at the rear of a building will give you a room long enough for a long lounge or dining room, or two squarish rooms. It is a popular technique for creating a kitchen at the rear of old cottages, particularly if it is possible (and convenient) to create a step down so that the ground floor eave is raised. A catslide will generally also produce a very interesting roof shape. It need not necessarily be built using timber frame and can add considerable interest to a traditional or vernacular-style building. The catslide method will not work as an extension technique on houses which have roofs with a very shallow pitch. An orangery looks most appeasing on a traditional home. They differ from conservatories as they tend to have more substantial brickwork (perhaps forming supporting pillars) and they usually have a partially solid roof. 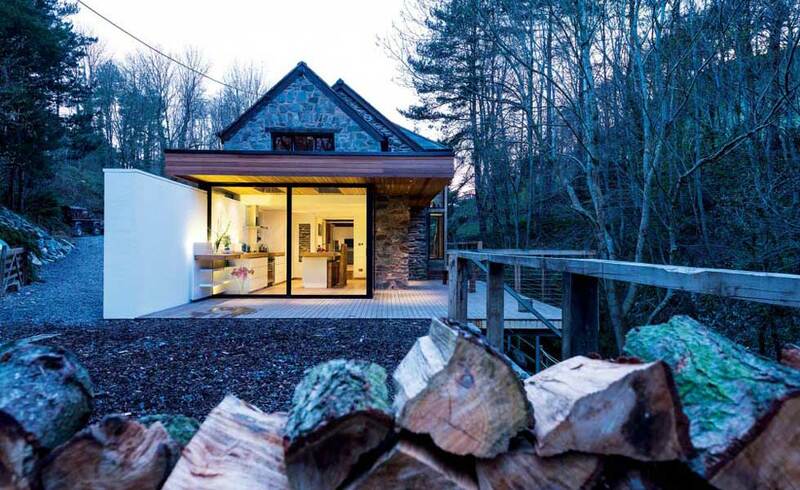 The look can be achieved by adding bi-fold doors and a roof lantern to a brick extension. The cost of adding an orangery ranges between £20,000 and £70,000, but price will depend on the amount of glazing and the complexity of the design, as well as size. Flat roofs got a bad name towards the end of the twentieth century. Many of those built in the 50s and 60s were built quickly and cheaply and started to fail, leaving homeowners cursing their construction. You also see lots of poor flat roof extensions built on to Victorian terraces with cheap and poorly insulated, felt roofs. If done well, a flat roof extension carries several benefits. For one, a flat roof uses less material, so can be done for less than a pitched roof (although you should tread carefully to avoid the issues blighting the midcentury flat roofs mentioned before). What’s more, with structural reinforcement, you can use the roof as a roof terrace for a room on your first floor. This means your single storey extension actually creates two storeys of living space — one inside and one outside. This effectively negates any loss of space in the garden. I am planning to remove a large 36 ft conservatory on the back of my house with a timber frame pitched roof extension – approx half the size of the existing conservatory. *Do I need planning permission? *Do conservatories have foundations adequate for timber frame construction? *does anyone have any thoughts on bi-folding patio doors??? Is it possible to do a small extension using some kind of post and frame method that eliminates the need for foundations? Could a steel frame be used for example? has anyone got any details/dwgs they can pass onto me for a steel box frame application as is sometimes used in mid terraced extensions to reduce lateral sway, I have seen the done but can’t find any details on them anywhere. I’ve reposted your question in the forum so as to increase the likelihood of a response. No worries. Hope someone has the info you need. Hi I would really like to find some companies which would do 2 storey house extensions please.